The Army Medic is one of the guys in an Army unit that may not be the best shot, and in some cases may not fire a single shot in a combat situation, but he is the one who is dodging bullets, shrapnel, and explosives to save a fellow member of the unit. 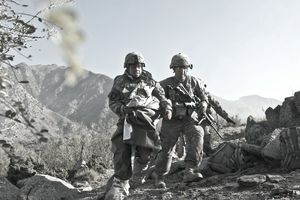 With the standard kit of medical supplies in the backpack, the 68W Army Military Occupational Specialty (MOS) waits for the call from his fellow soldiers, "Medic!" Often heard screeching from the front lines, the combat medic makes his way to find the injured soldier and get him secure enough to ship back to the field hospital by medical evacuation (MedEvac). Many combat medics in the Army risk their lives to take care of a fallen soldier. Many become highly decorated for bravery and perform over and above the call of duty earning awards such as the Congressional Medal of Honor. The recent popular movie Hacksaw Ridge tells the story of Medal of Honor Recipient Private Desmond Doss, an Army Combat Medic who did not carry a weapon into combat, but all he did was save men from his unit. During a day and night of fighting, Doss saved over 75 men who were wounded and left for dead by the retreating Americans in Okinawa. The MOS where you receive this type of medical training is the 68W (68 Whiskey). The Army Military Occupational Specialty is one of the most important jobs in any unit because there are always injuries, accidents, illnesses, and in some instances emergency medical issues and combat-wounded that need help on the battlefield. The 68 Whiskey is the person who is trained to do just that. Basic Job Description of the 68W "Combat Medic"
The Health Care Specialist is primarily responsible for providing emergency medical treatment, limited primary care, and health protection and evacuation from a point of injury or illness. Health Care Specialists are often called "combat medics" in the Army because some Soldiers in this MOS are assigned to deploy with Army combat units and provide emergency medical treatment directly in combat zones. Other Health Care Specialists are assigned to military hospitals and clinics to assist doctors and nurses with the health care needs of patients. Administer emergency medical treatment to battlefield casualties. Assist with outpatient and inpatient care and treatment. Interview patients and recording their medical histories. Take patients' temperature, pulse, and blood pressure. Prepare blood samples for laboratory analysis. Keep health records and clinical files up-to-date. Give shots and medicines to patients. Prepare patients, operating rooms, equipment, and supplies for surgery. Some of the more common needs of the medic are to administer intravenous solution in the field to soldiers dehydrated from long movements and training. Job training for a health care specialist requires 10 weeks of Basic Combat Training and 16 weeks of Advanced Individual Training, including practice in-patient care. As a 68 Whiskey in your unit, you will be expected to know your job and be available to those in need at a moment's notice. If caring for others, applying medical knowledge and experience, and being able to remain calm and think when someone is having the worst day of their life is something you have a calling to do, the combat medic profession needs you. What Is a Army Respiratory Specialist?